This video shows you how to get a professional facial at home for the most radiant skin. It’s easy to create a “At Home Spa” right in your kitchen using healing herbs from your garden and teas in you cupboard. Nothing feels better or creates more radiance to the skin than a healing herbal steam. The steps in the video above will get you started but don’t be afraid to mix it up. Aromatherapy is treatment through scent. Different aromas are thought to have different effects on us physically as well as our moods, feelings, and mind. Some invigorate, (citrus or mint), some make us relax (lavender or chamomile), some make us feel nostalgic (rose and sandalwood), and some relieve nausea or headaches (chamomile or spearmint). The list goes on and on. Aromatherapy can be very effective not only because it can treat your mind but also treat your skin at the same time with the natural healers. Steaming is a great way to release this healing power. 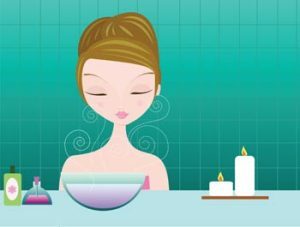 When boiling water is poured over the natural healers, the oils are released into the steam and are absorbed into your skin as well as breathed into your body. Make sure your face is clean and make-up free. Remove any surface dead skin build up with a peel off mask or a scrub (if you desire or as needed). This insures your pores are clear as they open during steaming. Combine a handful of each: fresh mint or peppermint, lavender, chamomile, rose hips (center bud of the rose flower), and a few orange or lemon peels. Use tea bags of these ingredients if you can’t get them fresh. Place mixture in large bowl (I like to use a wooden salad bowl) and fill bowl a little over half full with hot water. Place your face over the bowl with a towel to cover your head and steam for about five minutes. Afterwards splash your face with cool water and follow with your favorite facial treatment mask like one with clay or moisturizing. With the pores open this is a perfect time to use your mask. Rinse with warm water or use a warm washcloth to remove mask. The last step is to moisturize face and eyes, as well as feet and hands. 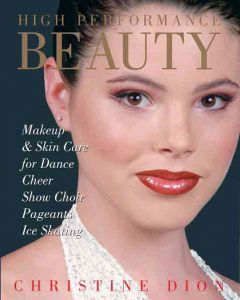 For a complete guide on beauty and health recipes, skin and body care along with all the makeup tips needed for performer’s see Christine Dion’s Book High Performance Beauty. Available at modedion.com (ON SPECIAL for $15.00 reg. $24.95) or click here to purchase on Amazon.com.